While most builders are struggling to stay afloat, Epcon Communities introduced seven new floor plans in 2008. Courtyards at Seldom Seen will only offer 50 new courtyard style condominium homes in this very popular area. The Courtyards at Seldom Seen is one of the newest Epcon Communities located in Powell, Ohio / Delaware County / Liberty Township and offers Olentangy schools. The courtyard style homes were planned in response to a ground breaking study that revealed "Boomers" affinity for outdoor living and recreation, as well as a need for privacy and desire to have an all-in-one home. Epcon's Courtyard Collection of Homes are distinguished with visually exciting interior and exterior design elements, superior construction materials and coveted quality features. New bonus suite options are also available in these new floor plans! Homes offered in the Courtyards at Seldom Seen are available starting at $168,900 for attached homes, and $204,900 for stand alone, detached homes! Contact Anita Smith at (614) 207-2526 for additional information and availability! 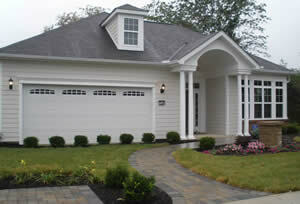 Exterior materials have been carefully selected to create a high quality appearance and minimize future maintenance. Private courtyard with enclosed and private patio standard in every home. Many courtyard optional features such as fire pits, fountains, trellises, and landscaping options. The Classic Courtyard home collection combines the convenience of single-story living with lots of privacy for each resident. stainless steel appliances, and much, much more! None of the exterior maintenance - ALL OF THE AMENITIES!